I ran the Christmas shopping gauntlet at John Lewis today - not for the faint- hearted. The main aim of my game was to find stocking fillers for Popeye, which is difficult because he is fussy, has already got most of the things he wants or needs, and is generally very disparaging about things you buy for him. In other words, a challenge. 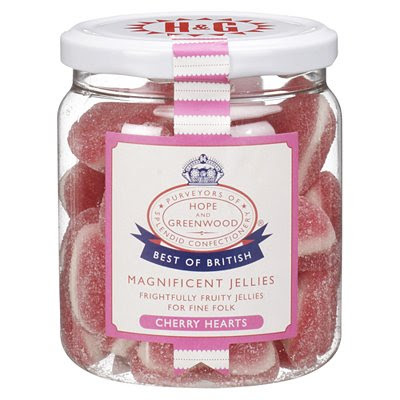 So I saw these jars of sweets by the lovely company that is Hope and Greenwood. I thought that they'd bring back fond childhood memories for Popeye, but the thing is, I don't ever remember spending £6 on jelly sweets when I was a child. Then I started thinking about a nice jam jar I had just put through the dishwasher at home, because I was going to do a follow-up to my Empty Vessel post, and show you all how it would make a lovely pen pot, or jar to keep your paper clips, rubber bands and drawing pins in. And I thought, well I'll just make a little jar of sweets of my own, and put that in his stocking. When you've finished your jam, put it in the dishwasher, and when it's done, the label just kind of falls off, without leaving any sticky residue on the glass. If you want to go the extra mile, you could even make a label of your own and stick that on. That's this weekend's activity. p.s. if you're worried that this will ruin the surprise for Popeye of what he's getting in his Christmas Stocking, then panic not - he barely glances at my blog, and so won't suspect a thing.